Our leading researchers are making an impact through their dedicated research within the field of Ecology and Conservation. Your learning will be heavily influenced by their world-class research, which drives national and international policy agendas around environmental change and global sustainability. This distinctive course concentrates on the biological principles underlying biodiversity, its assessment and management. You’ll learn to identify plants and animals, explore the institutional framework underlying biodiversity and conservation and gain key analytical and practical skills for a range of academic and professional careers. You’ll also gain valuable experience in biodiversity and conservation-related research. This degree offers you a wide range of options, allowing you to personalise your study in preparation for further academic research or professional development in the field. We’ll equip you with a diverse set of skills needed for ecological careers and further research. The course combines theory-based modules on the principles of ecology and conservation with a wide range of practical skills-based modules. These include survey, management and identification skills, where the emphasis is on spending time in the field, and analytical skills such as statistics and GIS. The independent research project is one of the most important and potentially fulfilling parts of the degree. Projects cover a wide range of topics and usually include around six to eight weeks of practical work. A number of our students have been based overseas for their project. If you study part time, the course will last for two years and you’ll study around half of the total number of modules each year. MSc or MRes – what’s the difference? MRes students have fewer taught modules, and carry out two major research projects rather than one. 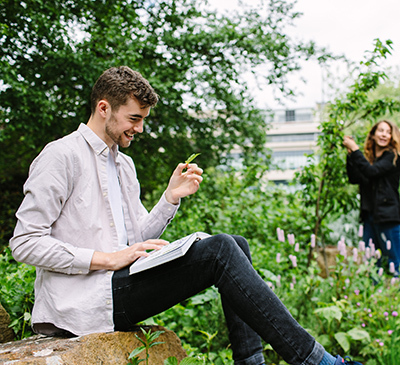 The MSc is the broader course, suitable for both conservation careers and PhD study, while most students taking the MRes are planning to go on to do a PhD. The MSc allows students to widen their skills base through the additional taught elements that are available. An increasing number of students treat the MSc as a conversion course, after having taken degrees in non-biological subjects. You'll have access to the very best learning resources and academic support during your studies. We’ve been awarded a Gold rating in the Teaching Excellence Framework (TEF, 2017), demonstrating our commitment to delivering consistently outstanding teaching, learning and outcomes for our students. Through your research project and biodiversity and conservation modules, you’ll receive substantial subject-specific training. Our teaching and assessment methods are designed to develop you into a professional who is able to think independently, solve problems, communicate effectively and demonstrate a high level of practical ability. As an MSc student, you’ll carry out one research project. The range of project topics is large and diverse, covering applied, empirical and theoretical subjects. Projects can be carried out in the UK or overseas: projects have been carried out in over twenty countries so far, and this year alone we have projects in Mexico, Thailand, Kenya, Egypt, Spain and Cyprus. There are many opportunities to develop valuable practical skills through modules such as Practical Conservation with the National Trust, Insect Identification, Plant Identification, and by overseas field courses within Europe and Africa (see field courses) and research project work. You can also build your analytical skills, with modules in GIS and statistics. Leeds is one of the best locations geographically to study Biodiversity and Conservation. You’ll be within easy reach of three areas of great natural beauty and dramatic scenery; Yorkshire Dales, North Yorkshire Moors and the Peak District – providing you with a wide range of project and fieldwork opportunities. We use a variety of assessment methods: practical work, data handling and problem solving exercises, group work, computer-based simulation, essays, posters and oral presentations. If you choose to study the African Ecology Field Course, you will pay an extra £2,250 in addition to the course fees. Our graduates have gone on to a very varied range of biodiversity and conservation jobs and careers around the world. We know that the subject knowledge and training we provide is excellent, but we’re also trying to produce well-rounded graduates who have the skills, experience and confidence to succeed in a challenging job market. You’ll have the opportunity to develop specialist and transferable skills on our degrees, opening up diverse opportunities when you graduate. As with many of our MSc and MRes graduates, you could go on to study for a PhD and enter a research career. You could also go on to a career in an applied ecology or conservation-related area. Potential employers look for academic qualifications in combination with practical skills and experience, and a relevant MSc course can give you the edge in a highly competitive field. The course has strong links with potential employers, including Natural England, the National Trust, conservation bodies and commercial ecological consultancies, both local and national. These employers contribute directly to teaching on a number of our modules, providing key practical training and invaluable networking opportunities. A substantial proportion of our graduates undertake further study at Leeds or elsewhere. Recent graduates have gone on to PhD positions in the UK and overseas eg in USA, Germany, South Africa. The Biodiversity and Conservation Internships module allows you to carry out a sandwich year, giving you a 12-month period of work experience in the middle of your course. You’ll arrange your own internship (normally either one 12-month placement or two 6-month placements), which should be relevant to your degree scheme. Typical internship venues include conservation organisations, statutory agencies, consultancies, research centres and nature reserves. We see great value in the learning opportunities offered by practical field courses. We offer two optional field courses in African Ecology and Mediterranean Ecology as part of the degree; if you wish to take the African Ecology field course, you should apply for the ‘with African Field Course’ programme. Both courses run in the Easter vacation and, along with the research project, are often one of the highlights of the degree for many students. The Mediterranean field course takes you down to southern Spain to experience an entirely different ecological landscape. Andalucia is among the most arid areas in Europe, with a flora and fauna that are very different to those of the UK. You’ll carry out projects on the unique plant communities that thrive in the gypsum soils, and the diverse array of pollinators, butterflies, beetles and scorpions that are abundant on the site. You’ll also have the opportunity to study the migratory birds that use the area as a pathway from Africa back to summer breeding grounds in Europe, the wild boar that roam the abandoned farm on which the field station is based, the bats that roost in the nearby gypsum caves, and the lizards that bask on the rocky outcrops throughout the site. Ahead of the visit, you’ll work in small groups to develop a research topic in collaboration with a member of staff, and produce individual literature reviews. You’ll then carry out research work in your groups during the field course, making use of the range of habitats and taxa available on the site. The course also gives you the opportunity to visit a nearby coastal town and the local cave system. The field course ends with team seminars before you travel back to the UK to produce a short, individual research paper. The African field course is based at Mpala Research Centre, Laikipia, Kenya. You’ll gain a first-hand appreciation of the ecology and conservation concerns of an African savannah community, both for the wildlife and the people who live in the area. As well as learning about the local environment, flora and fauna, and field safety procedures, you’ll spend most of the time designing and carrying out group research projects. You’ll produce project reports when you return to the UK. You’ll also give short presentations about key topics in the ecology and conservation of savannas, and where possible resident researchers will also provide guest lectures. These are always fascinating accounts of the science being undertaken at Mpala. We also offer a range of fieldwork within our Leeds-based modules. Your degree starts with an introductory residential weekend in the Yorkshire Dales, and throughout the year a number of modules are largely field-based. For example, Practical Conservation with the National Trust involves five days in the Yorkshire Dales working with Trust staff, while the Practical Conservation Skills module offers several different options.